Definition (FMA) Dense irregular connective tissue which consists of a papillary layer and a reticular layer. Definition (UWDA) Dense irregular connective tissue which consists of a papillary layer and a reticular layer. 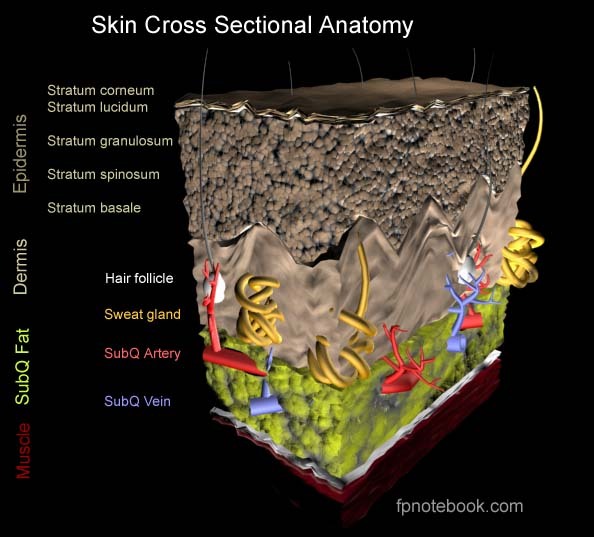 Definition (NCI_NCI-GLOSS) The inner layer of the two main layers of the skin. The dermis has connective tissue, blood vessels, oil and sweat glands, nerves, hair follicles, and other structures. It is made up of a thin upper layer called the papillary dermis, and a thick lower layer called the reticular dermis. Definition (MSH) A layer of vascularized connective tissue underneath the EPIDERMIS. The surface of the dermis contains innervated papillae. Embedded in or beneath the dermis are SWEAT GLANDS; HAIR FOLLICLES; and SEBACEOUS GLANDS. Definition (NCI) Desmosomes are intercellular anchoring junctions that anchor intermediate filaments at membrane-associated plaques in adjoining cells. Desmosomes assemble in response to cell-cell contact and raised levels of extracellular calcium. Sensitivity to calcium levels is lost as desmosomes mature. Definition (NCI_NCI-GLOSS) The outer layer of the two main layers of the skin. Definition (NCI) The epithelial portion of the skin (cutis). It consists of the following layers: stratum corneum (horny layer), stratum granulosum (granular layer), stratum spinosum (prickle cell layer), and stratum basale (basal cell layer). Definition (MSH) The external, nonvascular layer of the skin. It is made up, from within outward, of five layers of EPITHELIUM: (1) basal layer (stratum basale epidermidis); (2) spinous layer (stratum spinosum epidermidis); (3) granular layer (stratum granulosum epidermidis); (4) clear layer (stratum lucidum epidermidis); and (5) horny layer (stratum corneum epidermidis). Definition (NCI) Epidermal cells which synthesize keratin and undergo characteristic changes as they move upward from the basal layers of the epidermis to the cornified (horny) layer of the skin. Successive stages of differentiation of the keratinocytes forming the epidermal layers are basal cell, spinous or prickle cell, and the granular cell. Definition (CSP) vertebrate, epidermal cell of ectodermal origin. Definition (MSH) Epidermal cells which synthesize keratin and undergo characteristic changes as they move upward from the basal layers of the epidermis to the cornified (horny) layer of the skin. Successive stages of differentiation of the keratinocytes forming the epidermal layers are basal cell, spinous or prickle cell, and the granular cell. Definition (MSHCZE) Volná pojivová tkáň nacházející se pod vrstvou ŠKÁRY – podvrstvy KŮŽE. Může obsahovat TUKOVÉ BUŇKY, jejichž množství a velikost se odvíjí a různí podle lokalizace tělesné oblasti a stavu výživy. Definition (MSH) Loose connective tissue lying under the DERMIS, which binds SKIN loosely to subjacent tissues. It may contain a pad of ADIPOCYTES, which vary in number according to the area of the body and vary in size according to the nutritional state. Definition (FMA) Nonparenchymatous organ that consists of the epidermis, dermis and sets of hair and nails and which surrounds the entire body. Subdivisions of the skin surround various body parts; as a whole, the skin constitutes the external layer of the body. Examples: There is only one skin. Definition (OMS) Natural covering of the body. Definition (UWDA) Nonparenchymatous organ that consists of the dermis and epidermis. Subdivisions of the skin surround various body parts; as a whole, the skin constitutes the external layer of the body. Examples: There is only one skin. Definition (NCI) An organ that constitutes the external surface of the body. It consists of the epidermis, dermis, and skin appendages. Definition (MSH) The outer covering of the body that protects it from the environment. It is composed of the DERMIS and the EPIDERMIS. Definition (CSP) covering of the outer region of the body that protects it from the environment. Definition (NCI) Administration of a drug within the superficial epithelial layer of the skin.